Holds one 4x6 photo per page. Clear acid free pockets with white mesh background. Capacity: 36 Photos. Shipped in assorted cover designs. 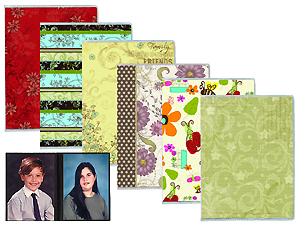 This compact flexible plastic mini photo album is great for classroom projects or party favor giveaways! Note: We do not offer design selection for this album. Albums ship in assorted, ever-changing designs and the image above may not represent the designs we are currently shipping.